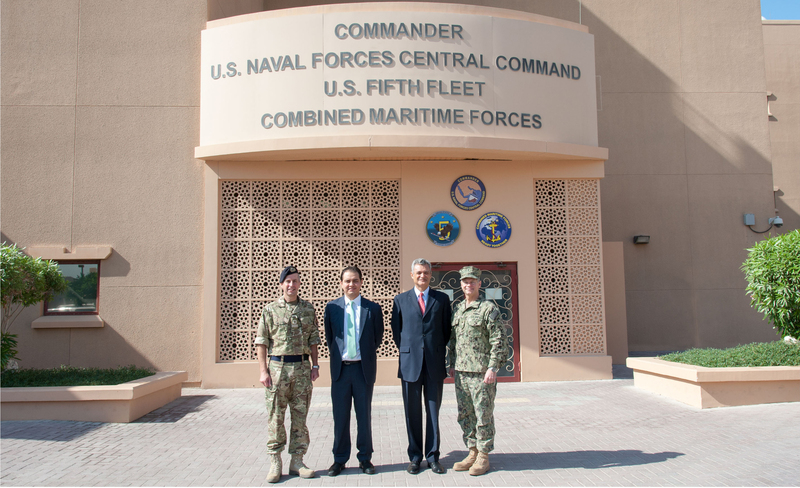 Ambassador Jose Arturo Trejo-Nava visited the Combined Maritime Forces (CMF) to gain an understanding of CMF’s involvement in the region. The Ambassador was given a greater understanding of CMF international operations into Maritime Security, Counter-Piracy and the fight against drug trafficking. He was particularly interested in knowing how Mexico and Latin American cooperation could help in these matters. Ambassador Trejo is the Mexican ambassador to Saudi Arabia and the non-resident ambassador to Bahrain, Oman and Yemen. He was accompanied by Consul Andres Galvan, Consul and Head of Political Affairs in the Embassy of Mexico in the Kingdom of Saudi Arabia. The Consul and the Ambassador who is fluent in English, French German and Russian firstly attended the CMF morning brief then went into a brief on the wider role of CMF by Captain Jerome Origny French Navy. Ambassador Trejo took office in the Mexican Embassy in the Kingdom of Saudi Arabia on Tuesday November 13th, 2007. He was a Graduate in Physics and Mathematics from the National Polytechnic Institute of Mexico and a Master’s degree in International Relations from Boston University. He joined the Mexican Foreign Service in 1980.